Talk about an interesting and different story! 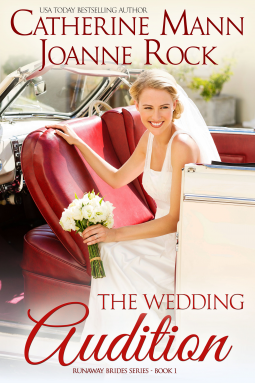 Co-written by Catherine Mann and Joanne Rock, “The Wedding Audition” (Runaway Bride Series 2), is easy on the mind, charming to read and warm to the heart. Runaway reality star and soon-to-be-ex-bride Annamae Jessup leaves behind a cable network show and takes a road trip to visit her roots. Her trip lands her in the apple orchards of Wynn Rafferty, a cop in a witness protection program. Annamae brings the gossip and tabloids in her wake, and Wynn tries to save her and himself from the threat of a Mafia lord. With felines and canines for company, Annamae discovers more than she bargained for, and in the process rediscovers herself and what she really wants to make of her life. Attraction and desire spark lust and love, and Wynn and Annamae succumb to the fire of passion. Witty dialogues and a sassy Grandma make this story even more fun to read. I have always loved Catherine Mann, and now Joanne Rock is a first time read, and this combo created a pretty magnetic story for the readers. Annamae is just hilarious and a bundle of surprises and Wynn is the ever magnetic and sweet guy who falls head over heels his raw harvest skills for the reality star. Enjoyable and romantic, “The Wedding Auction” definitely spreads smiles.